ResCare is a human services company that offers services to people of all ages and abilities to help make their lives more independent. This capability is very dependent on getting accurate information to the right people exactly when it’s needed. 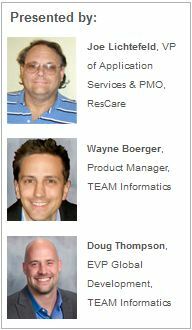 To that end, ResCare has partnered with TEAM Informatics to implement several aspects of Oracle WebCenter, including WebCenter Content and Image Process Management, as well as TEAM’s Google Search Appliance Connector. This technology has allowed ResCare to increase employee self-service, streamline AP approval processes, decrease paper storage costs, and improve document retrieval processes. This entry was posted on Monday, October 29th, 2012 at 1:28 pm and is filed under WebCenter Content. You can follow any responses to this entry through the RSS 2.0 feed. You can leave a response, or trackback from your own site.